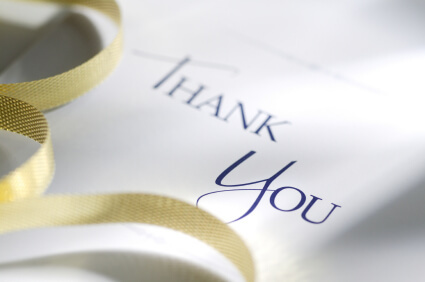 Some say “thank you” cards shouldn’t be typed… but we don’t think there is anything wrong with it! In fact, handwritten cards are so time consuming that many brides put them off for months and months after the wedding is over… and we think a timely, typed card is less rude than a late, handwritten card. Thank you so much for the ____________. (Write a sentence or 2 specifically about the present). Your thoughtfulness and generosity are very much appreciated! If they attended the wedding: We enjoyed seeing you on our special day and want to thank you for sharing it with us. If they did not attend the wedding: We truly missed you on our special day and hope we can get together soon.